Our riding lawn mower was out of commission. It breaks down about 20 times a year. I wanted to get the area the kids play in mowed, so I broke out this guy. We have a love-hate relationship. After mowing the areas by the porch, the swingset, and the sandbox with this mower (yes, it does work), I have a few thoughts. You may need a back surgeon when you're done. Or at least a chiropractor. Do you have something around your place that needs to be upgraded? Actually, we've found that newer does not always mean better. We've gone through 3 refrigerators in 10 years -- dang dog hair! We had a mower like that when I was growing up. I thought they were kinda neat, but scary. I have used one of those bit it has been years! Both our tractor and lawnmower have to be jumped off every time I want to use them! This machine looks lie a lot of work. It is a shame you can't tie it to a horse. LOL I used one of those once, once being the key word here. :O). It was hard! We say riding lawn mowers are made to drive us all crazy! Or put us in the poor house one. Its our joke around here. Hard as heck to keep one going and I don't care what brand it is! Oh...oh I detest those mowers! My grandmother had one when I was a teenager. We had one like this when I was a kid and I hated it! 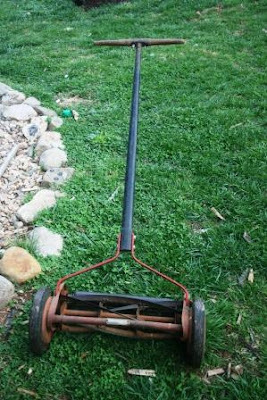 A few years ago, one of Amy's friends found one at a yard sale and begged his parents to buy it so he could mow the lawn with it, and he was happy as a clam! This was such a cute post!! My husbands grandfather used a mower like that. Even though they had over a one hundred acre farm and had tractors for it he always used a mower like that on there front yard and it always looked beautiful. I agree though it will really give you a work out! I will say that it could definitely be called an "Eco Friendly" mower!! I use to want one of those before we moved here. My hubby told me I'd regret it. We have the gas one & after reading your "cons" I'm glad I went with the other :) My back hurts just thinking about it! We have lots of things that need to be upgraded here! ha..I have never used a mower like that but have always wondered how difficult they are. Still finding morels! We are about 4200 ft here. Not sure what your elevation is, but I bet they are still out there. This has been a banner year. Those reel mowers are tough to use when things grow too tall. My Momvan is past "middle age" now, but it's paid for and by golly, I don't want to take on another loan! Gosh, when I saw this mower, I couldn't believe it's yours and you are using it. Snakes, really? Wish you lived around here, my husband repairs lawn mowers, he used to teach it. Does the same part break every time? Wow! The pros did sound good but then the cons didn't sound that appealing to me! lol I hope you get your mower fixed soon! Right now the only thing I know that needs fixed around my house is my truck. It's going into the shop tomorrow. Whew!...glad thats an antique,I so happy I can jump on the lawn tractor and go!...I have about 4acres to mow. And thank you for your visit and sweet commnet on the chair make-over. I would freak out if I walked by a snake, let alone used a push mower over one. Glad you got some good productive exercise out of the deal, hope your more convenient mower works soon! This contraption brings back memories of the unpleasant kind LOL. I get tired just looking at that thing. We need a new dishwasher. Ours is sad- and then I have to handwash. I hate dishes more than any chore. We used to own one of these years ago. Now we have a couple of acres to mow!